An asura named narakAsurA won the battle with Indra, the Lord of dEvalokA and kept him arrested. He tortured Indra in various ways. Indra, unable to bear these, prayed to Lord KrishnA (using his mind, body, and speech performed dhyAnA and prayers). 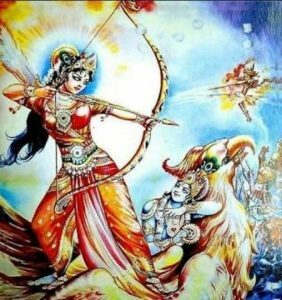 Pleased by Indras prayers, with the power of Krishna’s graceful eyes, sathyabhAmA killed narakAsurA on the early hours of the14th day of the month of Aipasi. Thus, the difficulties faced by the dEvAs and Indra was removed and Indra regained his state and remained happy. If we really analyze this story, it would become apparent that it is just an analogy. caturdasi – 14 methods (sAdhanAs). Thus, AtmA that is sat-chit-ananda svarUpA, gets entangled by the everexisting, indescribable, sat-asat-differentiation less avidyA and assumes the jIva bhAvA. Hence, it goes through the vicious cycle of life and death and due to some good deeds, starts to perform sagunOpAsanA (due to bhakti bhAvA) and becomes fortunate enough to gain the grace of IshvarA and hence attains a parOkSha Guru. Due to the Guru kaTAkshA, learns the fourteen sAdhanAs (methods) to attain the seven jnAna bhUmikAs. The grace of the Guru cuts out the mAyA and helps the jIvA to realize its true state of sat-chit-anandA. This is the tatvArthA (inner meaning) of the above said story of dIpAvali. What are the seven jnAna bhUmikAs? subhEchA – Desire for good. satvApatthi – Start thinking of Atma svarUpA by staying away from bodily desires. asamsatthi – Getting rid of the attachment to the body and remain in Atma svarUpA. padArthAbhAvanA – Remaining in a state where there is no knowledge of the world around. What are the fourteen methods (sAdhanAs) ? nityAnitya vastu vivEkA – The power of discrimination between the permanent Vs temporary / real Vs unreal / self Vs non-self. ikAmudrArttha phalabhOga virAga – (vairAgya) Dispassion to the enjoyment of the fruits of the actions here and hereafter. damaH – Having control over the senses (indriyAs). uparati – Follow svadharmA and remain in the state of completeness by withdrawal from wordly needs. titIkShA – Endurance of external situations. shraddhA – Faith in the sAdhanA, mArgA, and Guru. samAdhAna – Complete focus by harmonizing and balancing the mind to unwaver from its goal and allow it to walk the inner path with complete faith and endurance. mumukShutvA – An Intense seeking to get oneself free from the janana-marana cycle and attain enlightenment. shravaNam – Listening to the teachings, shrutis, vEdantAs, and most importantly Guru vAkhyA. mananaM – Reflecting on those teachings and Guru vAkhyAs. savikalpa samAdhi – Reaching the state of samadhi with a support of a focus; an egoless state; but the vikalpa (conceptualization) still exists in the form of the consciousness of the meditative state. nivakalpa samAdhi – Reaching the state of the samadhi where (vilInA) merging of all activities happens to such an extent that the distinction of the knower, the act of knowing, and the object known becomes dissolved (jAtru-jnAna-jyEyA abhEda bhAvaNa). For the existence of jIva bhAvA, mind is the key. Hence mind can be termed as mAyA or avidyA too. Hence the merging of mind is the only way to cut the grip of avidyA. As we can see from the above sAdhanAs (methods), this truly happens only in nirvikalpa samAdhi state. Hence, to remove avidyA all the fourteen methods (starting from vivEkA) is important. 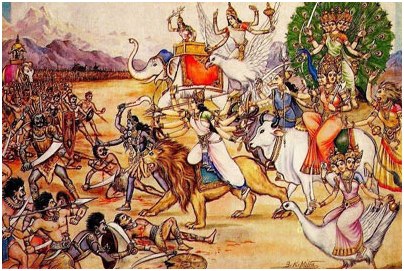 Another key doubt that would naturally arise is, why didn’t KrishnA kill narakAsurA? Was he not capable enough to kill him ? Since krishnA is a jIvan mukhtA, mAyA/avidyA/ajnAnA doesn’t exist before Him. Hence narakAsurA (representing avidyA/mAyA) doesn’t exist for krishNA. Just like there is no darkness for Sun, when there is no narakAsurA for KrishNA, who can He kill? Hence, satyAbhAmA representing the Guru killed narakAsurA paving way for the jIvA to easily reach the turiyA state using the 14 sAdhanAs. Note: The following verses from TripurA rahasya jnAnA khAndA (chapter 17) gives a detailed insight on the distinction between parOkSha and aparOkSha jnAnA. This is provided to help aid the readers to understand the difference between the roles of Krishna and sathyabhAmA in the explanation given by Shri. ChidAnandanAthA. AjAnA exists until the pUrna Atma svarUpam is not experienced. This pUrNa Atma jAnA is of two kinds 1. parOkSha jnAnA and 2. aparOkSha jnAnA. parOkSha jnAnA is obtained directly through guru and shAstra vicArAs. However, these come under understanding of concepts only but cannot be taken as an experiential knowledge. Hence, this parOkSha jnAnA cannot relieve a person from the circle of samsAra. The knowledge gained from the shastras might have helped a person to accept the shrutis due to shraddha displayed but bringing that to ones experience is not gained through parOkSha jnAnA. Hence simply staying at the paroKsha jnAnA state is useless in obtaining mOkShA. For this, aparOksha jnAnA is needed and this can ONLY be attained through experiences in the samAdhi state. This samAdhi state has the capability to destroy the differential thinking of jagat and the root cause for this – ajAnA. The end result is the endless Ananda state called mukti. The battle with narakAsurA happened during the month of aipasi, kRishNapakShA, starting from the first day till the fourteenth. Each day, one method was used. On the fourteenth day, the last method, nirvikalpa samAdhi was used and avidyA (narakAsurA) was killed. Immediately, the jIvA remained in the AnandA state. Thus, attaintment of the permanent blissful sat-chit-ananda state by the avidyA entangled jIvA is the celebration of dIpAvali. The brightness from the row of lamps shines constantly everywhere without any breaks. Similarly, the blissful state of AtmA also shines constantly everywhere without any breaks. The celebration is ONLY for those who fought the battle to cut avidhyA and reached the state of nirvikalpa samAdhi. Let the Grace of the Gurumanadalam shower upon us to give the strength to fight the inner battle using the 14 sAdhanAs and attain the nirvikalpa samAdhi. Wonderful information, explained in simple language. Thanks. There can’t be any better explanation. Just read quickly. Will have to take a print and read. Can there be a tamil translation?